During the past year, images such as above have caught the attention and imagination of our nation. Violence, justice, human rights, party politics.....accountability, corruption, commissions and parliament kasautis dominate the 'over the cup of tea/coffeee' discussions of Maldivians who are struggling to cope with the rivalry of colours brought about by this so called new dawn of democracy. A divided parliament , a country increasingly divided by party politics, youth on drugs, violent gangs and knife crime, damning audit reports, organised crime and our leaders locked in a never ending struggle for power are just some of the new realities the country has got to wake up to. Can the victory of either yellow or blue be more important than attending to the every day grievances of the average Maldivian? Or do we have to subject the nation and its people to such trials in order to achieve the true taste of democracy? What ever.................! How many such trials ? At what cost? What more is to come? Would it divide our families, create more rifts in relationships , destroy our social harmony, create trauma and stress , cause chaos and distress instead of providing the ordinary person with the chance for peaceful and harmonious existance? While we definitely need strength, patience and ability to discriminate what is right from wrong without the vested interests and influences of our leaders...as we pass through the current political climate, let us pray that our nation would not descend into a state of chaos. From the distance, beyond the rivalry of yellow and blue , I can see the pride of red, green and white, silently pleading to all Maldivians to be united in honouring what it stands for, instead of any commitment they may have formed with these new found colours. We were all eager to meet John Tyrell, the man who enlightened us about the fate of some 10 Maldivians who were picked up from the sea in 1735 by a passing ship and later lived in a place called Maldivia in St. Helena. John wrote in his blog article on Thursday, 14 February 2008. 'It is in Maldivia, situated in the Upper Jamestown valley. The area is named after slaves from the Maldives who worked in the gardens, then a Government Plantation, after they arrived on the island in 1735'. The article stimulated a lot of media interest back home. Many of us wanted to know more about the story. I wrote to John. I was definitely very interested in finding out more about what happened to these people. After my letter to John got published in his blog, a gentleman in foreign service in the Maldivian government phoned me and provided a headway to this developing story. According to him , a British anthropologist had contacted him in 1985 and provided information about some Maldivians who had lived in St. Helena. Unfortunately according to him this information had been lost over the years and the story had so far never been followed. He had promised to document what ever he knew about the story. He also told me that these Maldivians were really not treated as slaves but they were 'dumped on the island' but as they lived side by side with other Asians who were regarded as slaves even the Maldivians probably got labelled as slaves. I thank this gentleman for making the effort to phone me and for explaining these details. I wrote about this to John. John was quick to find out the facts about which he wrote in his blog on 15 th July 2009. 'The bits on Maldivia I found there are as follows:March 17.—Capt. Polly of the Drake at the distance of 150 leagues from land took up a Boat with ten Blacks of the Maldive Islands who were drove out to Sea and near perishing—three died on board, 5 Men, 1 woman and 1 boy landed here. [Note.—The Maldivia Gardens, then a Government Plantation, derived their name from the employment of these men therein. ]22nd March 1742 —Major Thomas Lambert arrived and proclaimed Governor.6th April—The property called " The Maldives" turned into a Hospital. 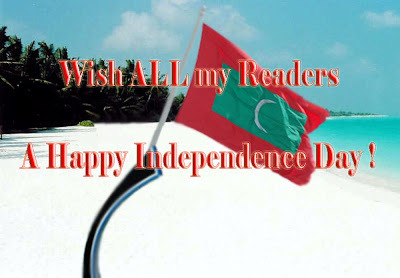 But before John wrote this piece on 15th July, 2009 we the Maldivian community in Manchester, UK decided that we must say a Thank you to this wonderful man who shed light about the lives of some of our own people who had drifted away from our country some 274 years ago. When I contacted the small Maldivian community in Manchester, everyone I spoke to wanted to meet John and felt a need to thank him. Perhaps it was because John had already visited Maldives 3 times before his visit to St. Helena, that the word Maldivia caught his attention such that he wrote about Maldivia and how the place got the name in this blog article . Over dinner on 14th July, 2009, I was eager to ask John whether there was any possibility of tracing back the descendents of these people. He told me that there is no folk memories about these Maldivians. I saw John looking at me. He told me it would be almost impossible to find out anything more about them. Searching for any Maldivians in St. Helena would be futile now. It was difficult to accept this, but I understood. We all understood this from our conversation with John. Ironically we were also 10 Maldivians (just like the 10 people who drifted away from the home country in 1735) who were currently living away from home...in Manchester UK. 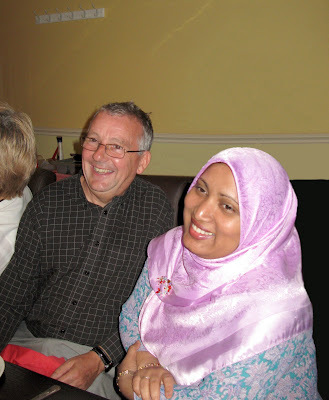 We all felt a need (cannot really describe why we felt the need but I guess its because we came to know about a bit of our own history through John) to say Thankyou to John and his lovely wife and we did so over dinner at Punjab Restaurant, Curry Mile, Rusholme. I am sure I will still repeat the same questions next time I meet him. There may be many others in Maldives who may do the same....when John and his wife decide to visit Maldives again. 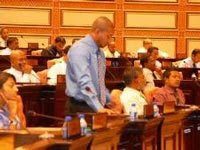 This is the man who was arrested in connection with drug dealing in Maldives on the night of July 2nd, 2009. He was apparently found along with possession of drugs and later over 5 million Rufiyaa and 43 thousand US dollars was found in his wifes room at H. Reendhooge. He has in the past been implicated and arrested on drug related offences committed in 2001, 2004 and 2007 but was released due to lack of sufficient evidence to convict him. The police reports that they have been following this man for over 7 months and his arrest is a direct result of a successful police operation. Some have reported that he is one of the drug barons of Maldives, directly engaged with the sale of drugs concentrated in the Southern atolls of the country. We are yet to find our how his modus operandi has been. Possession of the huge amount of money, does suggest that he may not be a peddler. However, we also know that due to the huge demand for drugs in the country,the sale of drugs such as heroin for just a few weeks can generate around this much of money or even more. While I congratulate our leaders and our police force for the high level of committment they are showing in dealing with the problem of substance abuse in the country, I still have numerous questions on my mind. Is this man really a drug baron or is he a pawn in the hands of a bigger man connected with the drug industry of our country? How did this man get initiated into this work? Who helped him? Who was associated with him? How did he manage to escape being convicted despite being repeatedly implicated in drug related offenses? Did he have connection with drug lords and gang leaders in the country? Was his work facilitated by anyone else? Who are the people whom he have recruited as his foot soldiers to sell drugs on our streets? How many young people have he abused by selling them drugs? Can he be charged with abusing children if he has sold drugs to underage children? How much money does he have in his accounts? What is the value of the money of his acquired wealth through the sale of drugs to our sons and daughters? Will this wealth be confiscated by the state? Can he break the drug mafia by revealing who his agents are, from where he is importing drugs, his drug smuggling routes. Definitely he alone could not have run such an operation. We have to see how the police operation continues and be on the watch out for more arrests and seizures as a result of the arrest of this man, probably a key figure in the illegal drug industry of Maldives. We must at this moment hope that there would be further arrests of such people and ensure that those arrested will not be able to escape the criminal justice system. He may have connections outside which will work heavily to prove him innocent once again. However, it appears that there is enough evidence this time to convict him. Hopefully so! Well done to the police officers who arrested this man. Let us hope that all those people who are flourishing in crime against our innocent youth and children are bought under the long arm of law soon. Let us hope this is going to be a begining of an end to those who have been silently killing our sons and daughters for decades.